Storm doors are installed outside of exterior doors to protect them from the elements and create an insulating air space between. 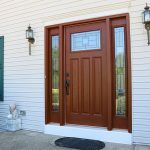 They are designed for protection, but many homeowners like the added benefit of the extra air flow that a storm door allows in warm weather, as well as the additional insulation they create during colder months. 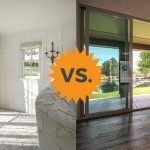 Unlike the storm doors that many of us remember from decades ago (those unattractive aluminum contraptions that were both difficult to operate and look at), today’s models are available in many different forms and will accent rather than detract from the overall appearance of your home’s exterior. A large range of materials and options affect price and quality. For homes with impressive entry doors, storm doors fitted with full view panels allow the exterior door to be seen. Some have kick plates to protect their lower portion. Vents on the top or bottom of the door allow circulation. When home security is a concern, storm doors can come with features such as grids and dead bolt locks to add an extra barrier of protection. Households with pets or small children will enjoy the open air feeling of a door fitted with a screen, while still having the peace of mind that their front door is still secure enough to prohibit any outdoor meandering. Need to find a pro for your Storm Door Installation? 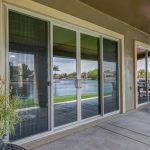 Some storm doors are designed to be entirely removed and stored, while others have screens which can be interchanged with glass or acrylic panels for use during warmer weather. Self-storing models allow the glass/acrylic panels to slide into another position on the door without needing to be removed. Storm doors that are exposed to large amounts of direct sunlight can be fitted with solar screens to reduce fading on any carpet or furniture behind them. The most popular colors are natural mill aluminum, bronze, and white but many manufacturers offer a wider assortment of colors including black, hunter green, almond, brown, cranberry, and even indigo. 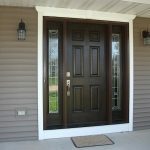 No matter what type of neighborhood or climate you live in, there is probably a storm door on the market that will not only suit your needs, but look good on your house, as well. While no house is completely “weatherproof”, certain additions and precautions can help your home endure some pretty harsh conditions. In areas where severe weather is common, a storm door is simply one element of the extra protection your home will need to keep it, and those inside it, as safe as possible. To truly get the most protection available, homeowners in inclement weather areas should consider installing storm windows and shutters or even think about building a storm shelter or implementing garage braces to turn an otherwise weak garage into a safe haven to wait out severe weather. 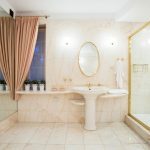 Different areas of the country are prone to different types of bad weather conditions, so not every precautionary installation will be a necessity everywhere. Most homeowners are aware of the risks the area they live in pose, and the things they can do to prepare for them. If you are new to the area you reside in, it’s a good idea ask your neighbors about what you can do to make sure your home is protected from the weather that will be common there. 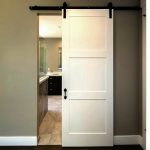 Prehung Doors: Easy Entry or Ready-Made Jamb? My storm door has sliding windows and a screen. The slides that allow you raise and lower the windows have worn out. Can they be repaired or do I need to purchase a new door?